Ultimate Fighting Championship (UFC) is gearing up for its next pay-per-view (PPV) offering, as UFC 236 goes down TONIGHT (Sat., April 13, 2019) from inside State Farm Arena in Atlanta, Georgia. 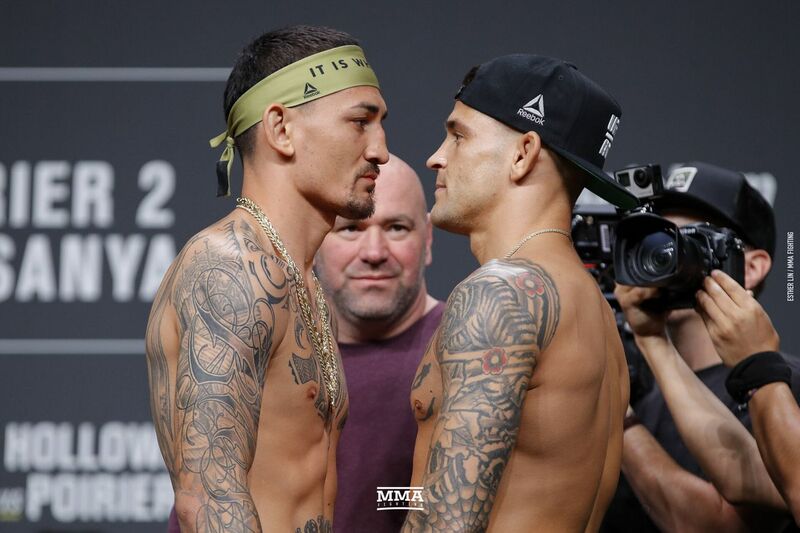 The event will feature an interim championship double-header as Featherweight champion Max Holloway moves up a weight class to face Dustin Poirier in 155-pound action. In the co-headlining act, Israel Adesanya and Kelvin Gastelum will collide for the interim Middleweight strap and the chance to face division king Robert Whittaker later this year. Since losing to Conor McGregor in 2013, Max Holloway has been on an impressive tear, racking up a ridiculous 13-fight win streak that includes back-to-back wins over former Featherweight champion Jose Aldo. He also scored notable victories against Brian Ortega, Anthony Pettis and Jeremy Stephens, just to name a few. Now, Holloway will look to add to his resume as he attempts to become the promotion’s next “champ-champ” by winning the interim Lightweight title. In doing so, not only will the Hawaiian-born fighter enter the history books, he will set himself up for the biggest title fight of his career against current 155-pound king, Khabib Nurmagomedov. If he can pull off those two wins in consecutive order, there is no question “Blessed” belongs at the top of the pound-for-pound list. Standing in Holloway’s way is Dustin Poirier, a man who will get his first shot at winning UFC gold after 21 fights inside the Octagon. It seems it was just yesterday that “The Diamond” was asking to be released from his contract because of UFC’s hesitance to reward him — or other deserving combatants — of their shots at gold. UFC heard him and gave him an interim title fight against one of the best fighters in the game today. Of course, he can also thank Tony Ferguson for turning it down. Nevertheless, Poirier has his chance and he isn’t about to let it slip without giving it his all. To give him further confidence, he already holds a win over Holloway, defeating him way back in 2012. Sure, both men have improved leaps and bounds since then, but it’s still a notch on his belt and it’s something that still weighs heavy on Holloway’s mind. If Poirier can get another “W” over “Blessed,” it could be what catapults him into superstardom. Every now and again you get one of those fights where you just hate the fact that one person will be leaving with a loss ... this is one of those times. Israel Adesanya has talked the talk, and over the last calendar year, walked the walk, too. Indeed, “The Last Stylebender” competed five times since Feb. 2018, taking out Anderson Silva in his previous fight at UFC 234 (see it). His run was good enough to put him in an interim title fight against Kelvin Gastelum. Adesanya is being touted as UFC’s next big star, and he could very well be just that, as he has the charisma and personality that could land him bigger fights, money and shine moving forward. Getting through Gastelum, though, is no easy task. The former The Ultimate Fighter (TUF) winner has been through the fire, facing and defeating former champions such as Vitor Belfort, Johny Hendricks and Michael Bisping, while also scoring wins over the likes of Ronaldo Souza and Tim Kennedy. Believe it or not, this will be his first time fighting for UFC gold despite competing for the promotion for more than five years now. Gastelum was set to bang it out against Robert Whittaker for the strap earlier this year, but “The Reaper” was forced out with numerous injuries. Nevertheless, Gastelum looks to lock down another date with Whittaker if he can become the first man to solve the Adesanya riddle. And as he’s stated numerous times, there isn’t anything Israel will bring to the table that he hasn’t already seen before from some of the greats. Sure, we have a nice interim championship double-header, but the rest of the main card is lacking a bit. Don’t get me wrong, Eryk Anders vs. Khalil Rountree is going to be a bangfest, but if UFC wants to push ESPN+ a bit more — which is now the only way to order PPV events — one would figure it would have stacked the deck to entice more new subscribers. Maybe it should've kicked off that new venture with this fight card. Paige VanZant was set to face off against Poliana Botelho at this event, but “12 Gauge” was forced to bow out of the match up after she suffered an injury. Other than Paige’s unfortunate fractured arm, there were no other injuries that plagued this event. Undefeated (8-0) Welterweight sensation Zalim Imadaev will bring his knockout power to the Octagon after running over everyone in Russia to the tune of eight knockout wins as he faces off against Max Griffin, a six-fight UFC veteran who has been unable to find his groove thus far inside the eight-sided cage. Still, that doesn’t make Griffin any less dangerous, so Imadaev will have his hands full if he wants to make an explosive entrance. Boston Salmon will finally get his chance to shine inside the Octagon after punching his ticket on Dana White’s Tuesday Night Contender Series (DWTNCS). Indeed, Salmon was set to make his UFC debut a couple of times before, but injuries to either him or his opponents have forced cancelations. Now, he’ll get the chance to make his debut against Khalid Taha, who came up short in his UFC debut one year ago. Randy Costa will put his undefeated (4-0) mark on the line to face Brandon Davis, who hasn’t had the best of luck in his last few outings, losing to Enrique Barzola and Zabit Magomedsharipov. Davis has gone 1-3 so far in his UFC career, so if he wants to avoid a pink slip, he needs to pick up a win against Costa. To get a closer look at all of the UFC “New Blood” click here. Again, if you’re excepting the “big names” on the undercard, you’re not going to get them. But, what you will get are some interesting match ups, including the headlining bout between Jaline Turner and Matt Frevola. Matt is coming off a draw to Lando Vannata and prior to that he suffered a loss to Marco Polo Reyes. In his way is Turner, who scored his first UFC win against Callan Potter at UFC 234. Both men are looking for breakout wins, and with UFC signing fighters left and right, they need to put exclamation points in their performances if they want their share of the spotlight. Wilson Reis will look for back-to-back wins for the first time in a long time when he takes on Alexander Pantoja, who is 4-1 inside the Octagon. In early action, Curtis Millender will look to start another streak after having his nine-fight win streak snapped at UFC 232 by Siyar Bahadurzada. In his way is Belal Muhammad, who recently had his own four-fight win streak snapped by Geoff Neal in his last outing. Muhammad has been fighting for UFC for three years now, but has failed to get on the promotion’s radar when it comes time to handing out the promo love. Losing his last outing didn’t help, but a win over Millender can be a start in the right direction. To get a better look at all of the “prelim” action click here and here. Anders exploded onto the UFC scene in 2017 with a first round knockout over Rafael Natal. While the former football player showed promise, his Octagon career since then has been lukewarm, going 2-3 including dropping his previous two bouts to Thiago Santos and Elias Theodorou. While I don’t believe he will be cut with a loss, losing three in a row simply isn’t a good look. Before the championship double-header, the main card boasts three other match ups. Ovince Saint Preux will look to get back into contention when he faces off against Nikita Krylov in Light Heavyweight action. Loser of two of his last three, “OSP” could use a big win if he wants to stay in the mix. While Krylov isn’t the biggest name, he is hungry to score his first UFC win after coming up short in his debut in Sept. 2018. It wasn’t that long ago that Saint Preux was mixing it up with the likes of Jon Jones, so if he wants to get back to those types of fights he needs to take out Krylov impressively. Alan Jouban will look to score his first consecutive win streak since 2016 when he faces off against Dwight Grant, who scored a last-second knockout win over Carlo Pedersoli Jr. last month in the very first round. Jouban also seemed poised for UFC stardom, but his back-to-back losses Gunnar Nelson and Niko Price really hurt his stock. Then, of course, we have the hard-hitting 205-pound affair between Anders and Rountree. Both men are coming off defeats and are eager to get the sweet taste of victory once again in order to not fall further back in what is suddenly a very crowded Light Heavyweight division. The event’s championship double-header makes up for the lack of other big-time match ups, as both the Lightweight and Middleweight divisions will have a clearer picture once the dust settles in the “ATL.” That said, there is no telling how the 145-pound weight class will be affected should Holloway win the title at 155 pounds. Still, both Khabib Nurmagomedov and Robert Whittaker will have set fights once they are ready to return, which should make for two big title bouts later in the year.